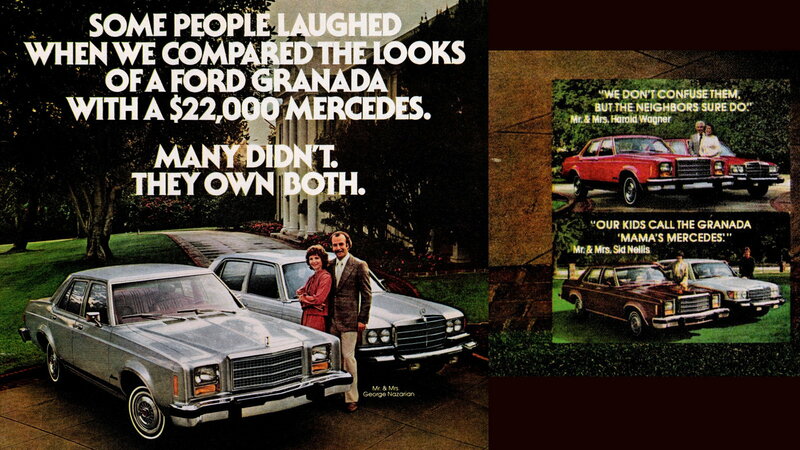 Comparing their Grenada to various Mercedes-Benz S-Class offerings was a cornerstone of Ford's 1970s marketing strategy. "The Mercedes 450 SLC is a possession of pride for those who can easily afford its formidable price tag." That's how Ford's U.S. print ad for their new Granada Sports Coupe, sold in 1976 and 1977, began. "Those who cannot, please read on," the copy requested. It wasn't until the third paragraph—magazine ads were wordier back then, readers weren't interrupted by mobile notifications and only Quincy had a pager—that FoMoCo's horse in the race entered. "You may notice that the Granada Sports Coupe is virtually the same size as the Mercedes 450SLC. But no car can be categorized "sports coupe" on its dimensions alone," the ad admitted. At least they were honest. The copy goes on to tout the Granada's various "heavy duty" suspension components before it brags of "European-style" stalk-mounted wiper and washer controls. To be fair, it was a lot easier to pull on a stalk than reach forward and pull/turn a dash-mounted wiper knob, but it takes more than that to make a car a Mercedes-Benz. 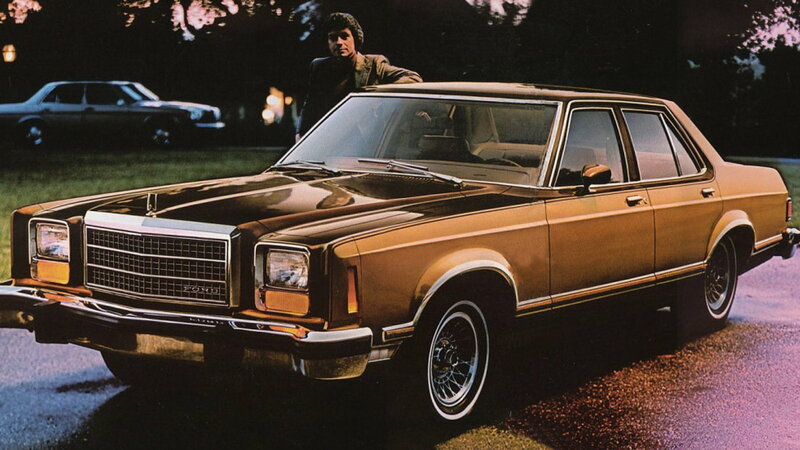 On the other hand, maybe Granada buyers thought, "ooh, just like a Benz," every time they flicked the wipers on. Ford unleashed the Granada on the American public as a 1975 model, and although it was originally intended to supplant the Maverick in the company's lineup, and possibly fold in Torino/Montego buyers along the way, the oil crisis and correspondingly high gas prices kept the Maverick around through '77. 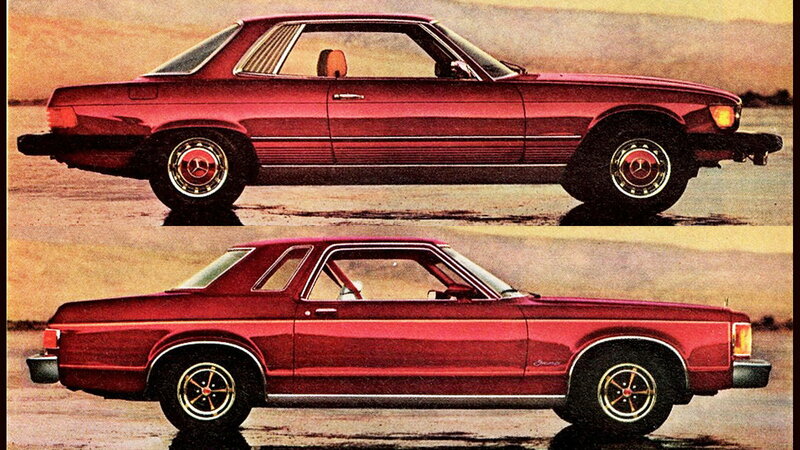 The first generation of the Granada, built from 1975-1980 (with a facelift in '78), was actually built around a chassis derived from the four-door Maverick, shared that car's 109.9-inch wheelbase, and featured a primitive live axle/leaf spring rear suspension. 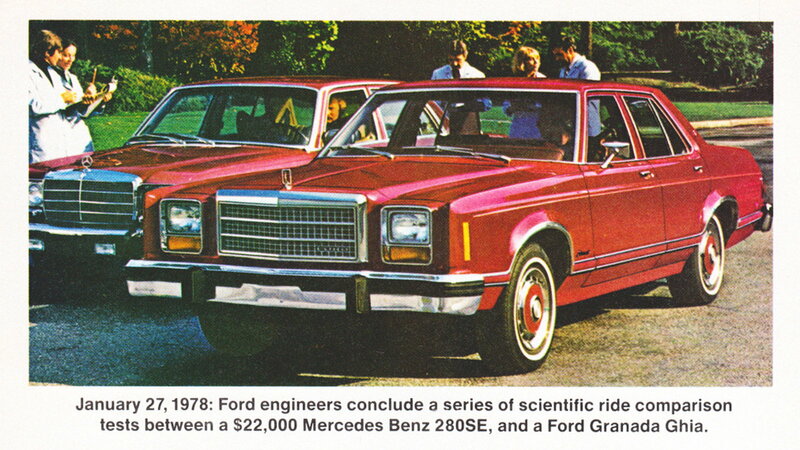 Ford reportedly looked to the Mercedes 280 (then the 114 platform) for styling and dimensional guidance, so when it came time to move some units, comparing the two was a natural choice. >>Join the conversation about Ford's attempt to compete with Mercedes right here in MBWorld. 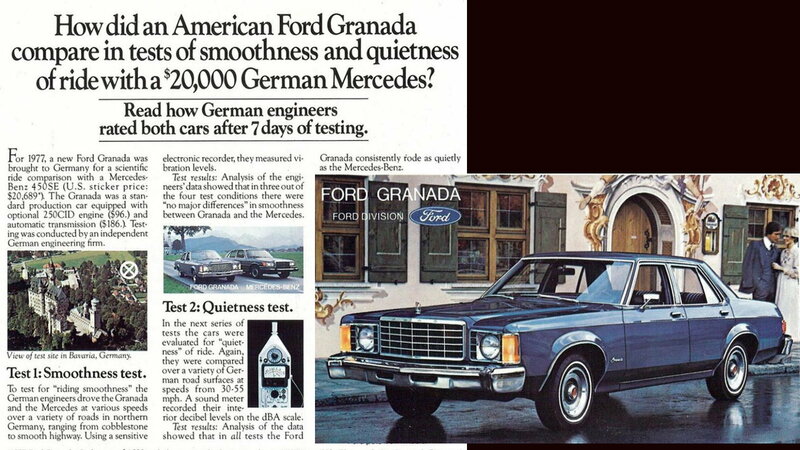 One such ad campaign—though by now the target of Ford's affection was the Mercedes-Benz 450 SE (W116)—centered around a trip to West Germany to pit Europe's best against the '77 Granada. Unlike the luxury-by-association 450 SLC ads, this campaign saw two uprightly boxy sedans squared off feature for feature. It wasn't a fair fight. The S-Class was powered by a SOHC 4.5-liter (276 ci) V8, producing 180 hp and 220 lb-ft of torque, that managed to get the 450 SE to 62 mph (100 km/h) in under 12 seconds, while the as-compared Granada made do with a 250 ci pushrod inline six, yielding 98 hp and 182 lb-ft of torque, pushing the lighter Ford to 60 mph in around 19 seconds. Of course, those ads that appeared both in print and on TV didn't mention the acceleration discrepancy. Instead, the comparison conducted by "an independent German Engineering firm" found "no major differences" in the smoothness of the ride. Also tested was quietness, and again the engineers' measurements showed the Granada to be every bit as silent as the Mercedes. Every story needs a hero, and Ford's coupe saved the day with $4,088 price tag vs the M-B's Goliath $20,689 sticker. Another ad told the story of three families who owned one of each marque. Photos show happy couples posed next to their "American classic, Granada," and, "German Classic, Mercedes." Instead of quotes from Germans with slide rules, these ads quoted couples stating, "We don't confuse them, but the neighbors sure do," and, "Our kids call the Grenada 'Mama's Mercedes'." Ford's facelift for the '78 Granada included the addition of an ESS model to the lineup. ESS stood for "Euro Sport Sedan." Though the new headlight treatment strayed even further from M-B styling territory, the new front end did bear a striking resemblance to Chrysler's successful Cordoba and GM's slam dunk second-generation A-Bodies (think Monte Carlo). The slightly schizophrenic styling added blacked-out Euro-style trim, just to cover all the bases. Mixed-signal styling aside, the ads were working—so how to make the ESS more closely resemble its M-B target? Hubcaps. Not only were the wheel covers a clever-yet-blatant nod to the classic Mercedes hubcaps, Ford made sure potential buyers didn't miss the similarity by including close-ups of them. The print ad even featured a box to check your guesses as to which car was which in certain photos, while the TV spot used a little industrial light and magic to strobe between identically-colored coupes with the cars' driver magically transported unchanged between frames. 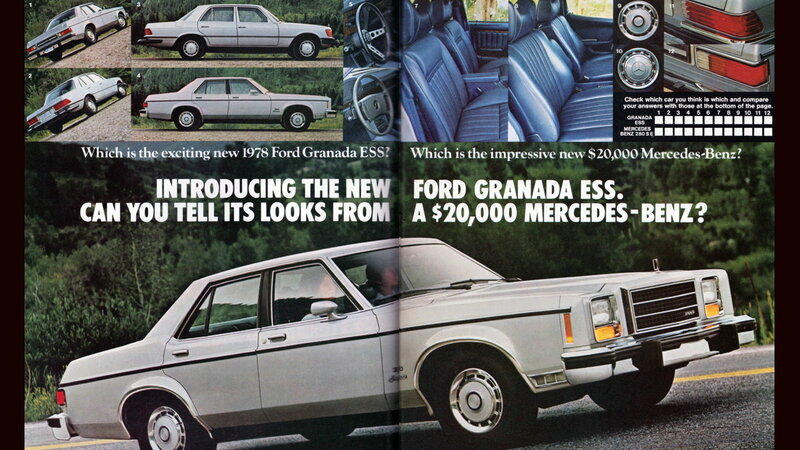 Both the ads and the Granada were big hits, with Ford selling over two million of the cars before production ended in 1982. 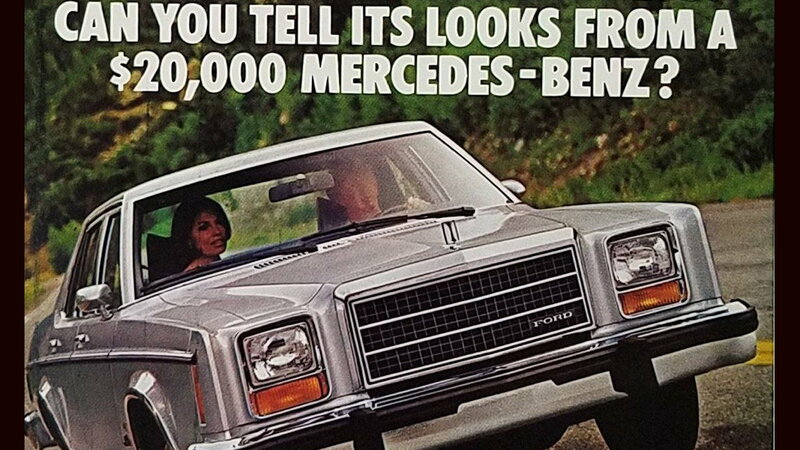 It's hard to say if marketing is more shameless now than it was back then, but 40 years later, Mercedes-Benz is still the Benchmark.